"It’s true you don’t see many dwarf women. And if fact, they are so alike in voice and appearance that they’re often mistaken for dwarf men." Have you ever wondered what it would be like to sleep in a Lothlórien flet? Ever imagined what it would be like to fall asleep while gazing up at a leafy canopy under a starlit sky? With this project, you can make your own bedroom feel like an outdoor Elven sanctuary! First of all, you’ll need to measure your ceiling with a tape measure to figure out how big you want your lattice to be. When you go to purchase your lattice, you should also get 4 one-inch wide pieces of wood to match the width of the lattice, and 4 one-inch wide pieces of wood to match the length of the lattice. (a total of 8 wood pieces) These will be used to make a frame for the lattice so it doesn’t sag in the middle. 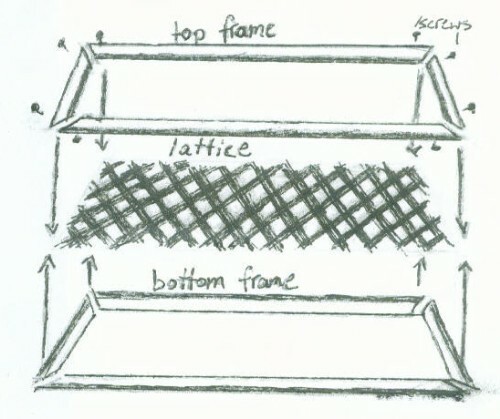 Fit the strips of wood together to make a top and bottom frame, as shown in diagram. The next step is “sandwiching” the lattice between the top and bottom frames. Lattice tends to split when a nail is pounded through it with a hammer, so at this point it is a good idea to drill holes for the screws using a screwdriver. Place in the screws (as shown) and make sure they are secure before moving on with the project. If the screws are too short and won’t hold both the top and bottom frames together, you can always drill more into the bottom side. Just keep in mind that these will show once the lattice is hung from your ceiling. Next, you’ll need to screw the 6 eye hooks onto the top frame. These will hold the chains to the lattice. Using a tape measure, carefully mark the ceiling where you want the 6 ceiling hooks to go, and drill them in place. Secure each of the 6 chains to an eye hook. 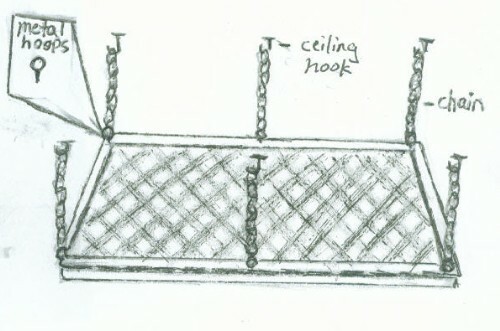 Then, carefully lift the lattice and attach each chain to a ceiling hook. You may need someone to help you with this. Your Lothlórien ceiling hanging is almost done! 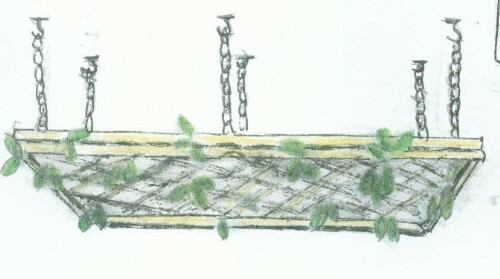 Taking the decorative leaves and vines you have purchased, arrange them into the lattice work in any way you like. For stars, take a string of miniature white Christmas lights and weave them carefully between the leaves and around the edges. Hooray! Your Lothlórien forest canopy is finished! The next time you wake up, it will feel like you’ve landed in Middle Earth! This sounds so amazing, I definitely want to try this one!